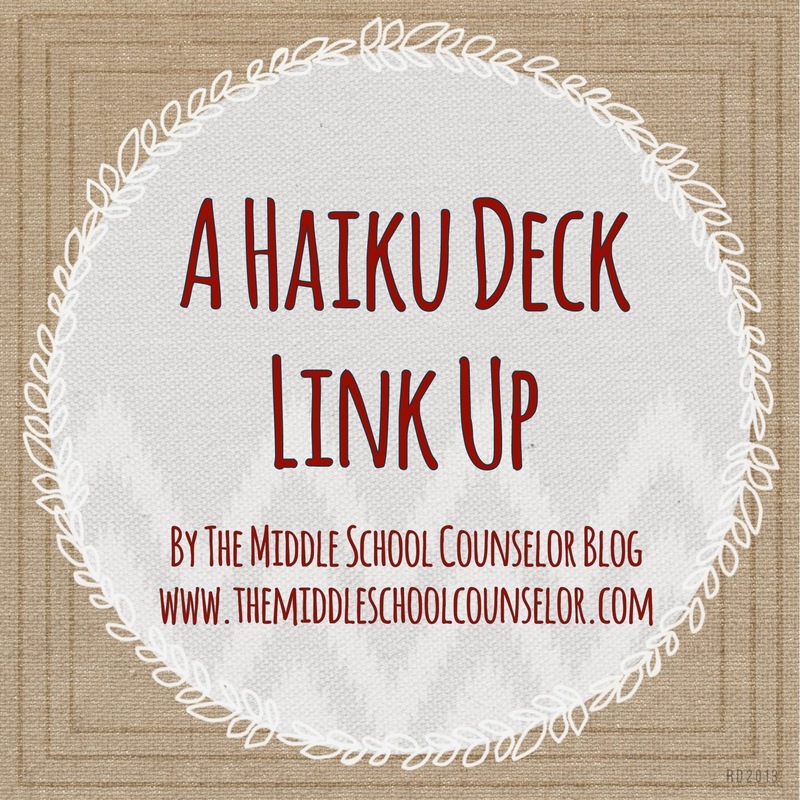 Join In The Haiku Deck Link Up! Technology is a must for school counselors. Everyday I try to learn something new. I am eager to expand my knowledge of technology because I really believe in the philosophy of working smarter, not harder. With so many new programs out there, there are lots of new things to try. I was excited when Franciene Sabens of School Counselor Space blog put together the smore Linky Party. It definitely made me try smore as a method of putting together a flyer for my colleagues. Although I used it before, I am happy to say that I think I found several new uses by participating in the Linky Party and I am sure I will use smore again. Susan Spellman Cann, a school counsellor in Canada, has put together some very beautiful Haiku Decks. Haiku Deck is an online presentation software program that let's you design simple, easy, and breathtaking slide shows. As it says online, start with a few ideas, add some amazing images, pick the perfect look and share. What could be simpler than that? Susan has inspired me to use this piece of technology and make a deck of my own. Here is my personal review. I would use this again. I think it will be great for my next Coffee With The Counselor as I talk about Early College Planning. Do you use Haiku Deck? Let's see some examples. Looking for other ways to connect with school counselors? Need a Group Icebreaker? Play Get to Know You Yahtzee! From time to time, I will have links to products on Amazon. We are a participant in the Amazon Services LLC Associates Program, an affiliate advertising program designed to provide a means for us to earn fees by linking to Amazon.com and affiliated sites. As a result I will receive a small compensation for doing so. I am not being paid to promote certain items, but rather I am sharing materials I use in my own counseling program. © 2015 The Middle School Counselor. Victoria Template designed by Georgia Lou Studios All rights reserved.